The Guardian tells us today: The grisly and mysterious tale of two British ships that disappeared in the Arctic in 1845 has baffled generations and sparked one of history’s longest rescue searches. 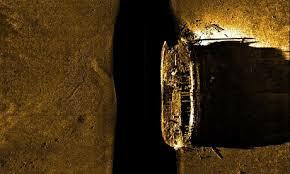 But now, more than 160 years later, Canadian divers have finally found the remains of one of the doomed Navy vessels. Legend has it that sailors on board the HMS Erebus and HMS Terror, who were chosen by the explorer Sir John Franklin, resorted to cannibalism after the ships became ice-bound in the Victoria Strait in the Arctic territory of Nunavut. Search parties hunted for the crew until 1859, but no sign of either ship was discovered until now. However, tantalising clues have emerged over the years, including the bodies of three crewmen, discovered in the 1980s. And by coincidence an AS class is today beginning to study Mary Shelley’s Frankenstein in which Robert Walton writes home to his sister, Margaret Saville, from St Petersburgh, on December 11th, 17—. 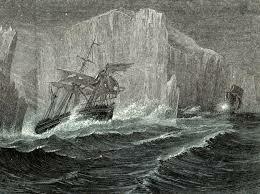 One of the three aspirers in Shelley’s book, Walton also hopes to discover the Northwest Passage. He too becomes trapped in the ice but then picks up the bedraggled and wasted figure of Victor Frankenstein. Victor’s tale begins as a moral warning about the dangers of over-ambition, how the pursuit of knowledge risks destroying the “tranquillity”of life and our “domestic affections”. This may have been Mary’s primary message, living as she did through the loss of a daughter the year before and Percy Bysshe’s roving eye and Byron’s restless wanderings. Despite her mother’s political radicalism and feminism and her father’s philosophical anarchism, I find it hard not to read the novel on one level as a rather conservative plea for a quieter life. Unlike Franklin and his crew, the ice eventually breaks up around Walton. This gives him the possibility of choice – and he chooses not to follow in Victor’s self-destructive footsteps but to turn for home, to Margaret, delivering his journal as the novel we now read. On the other hand, deriving from a dream she had in the year with no summer, 1816, there’s plenty in the novel that may have been brimming beyond the author’s conscious control. Victor is a tragic hero of sorts. Even when he is dragged on board, close to death, Walton senses “He must have been a noble creature in his better days, being even now in wreck so attractive and amiable”. Franklin, 50 years later, was another Victor, risking all; it cost him (and his crew) all they had. A failure, but a tragic sort of failure and one long remembered. But Walton’s journal is a story of two sorts of heroism: the one that never gave up as well as the one that chose life, the life of relationships. We remember Walton because of Victor. But I think Walton knew what he was choosing and maybe thought of it with equanimity in the anonymity of his twilight years.